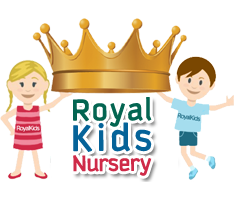 Royal Kids nursery is open for students all through the year, with the exception of weekends, country-wide private holidays. Parents don’t have to worry about finding alternative childcare during vacation time, as children will love attending the various “Camps” that we provide throughout the year. The standard nursery day runs from 6:30 am to 3.30pm, and follows a structured curriculum plan. However to provide parents with maximum flexibility, we are open until 5.30 pm. As children arrive, activities are set for the children in order for them to ‘settle’, relax and greet their friends at nursery. They are encouraged to ‘eat their breakfast’ focusing on social skills with a focus on peer interaction. Singing songs, reading stories and play activities will take place after breakfast. At around 8.00 am the classrooms are ready for the days’ fun and learning to begin! There is much more to RKN than curricular-fun! We foster and embrace holistic development. Afternoon Club provides continuous care for children who attend our morning nursery sessions. There is a strong emphasis on the three Prime areas within the EYFS (Communication & Language, Personnel & Social Development and Physical development. For children who stay late, afternoon nursery classes follow all the learning and development goals as our morning nursery sessions. Themes/topics are varied and differ from our morning sessions, allowing variation for our full-day boarders. Classes tend to have a stronger influence of extra-curricular activity.